Do you have a countertop you love, and cabinets that are less exciting? Maybe your cabinets are in good condition, but they look dated. Perhaps you want cabinets that are like new for less cost, and you want to be more eco-friendly by reusing what you have? 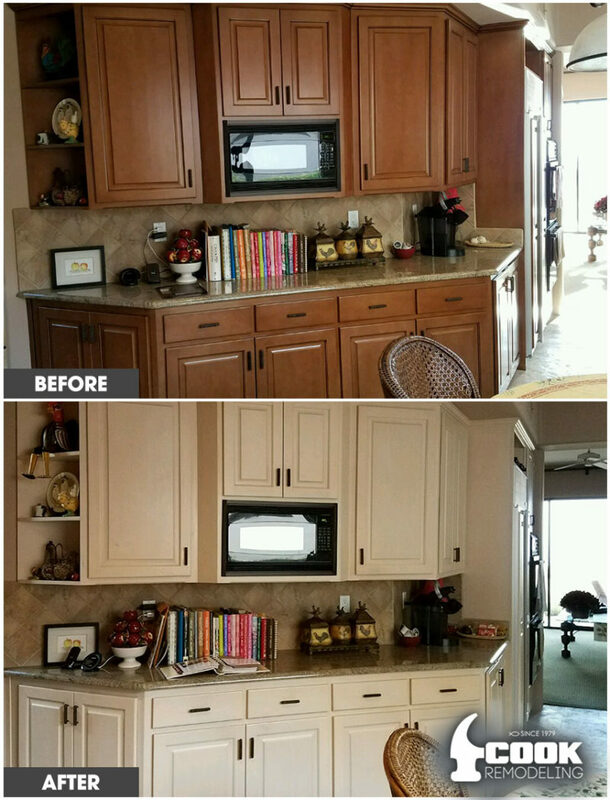 Cook Remodeling is happy to announce that we provide the service of cabinet refinishing and cabinet refacing. You can choose a new stain or color, or have us match other cabinets or furniture in your home. You can get new door styles. We can even create roll out shelves! You will want to use cabinets that have the box and frame in good shape. Shelves can be rebuilt, but if the cabinets aren’t going to last for a long time as they are, it may make sense to get new cabinets. Know that painted cabinets generally cannot go to stain because of the type of wood that is used. Oak cabinets are not good candidates to be painted because of the grain in the wood.